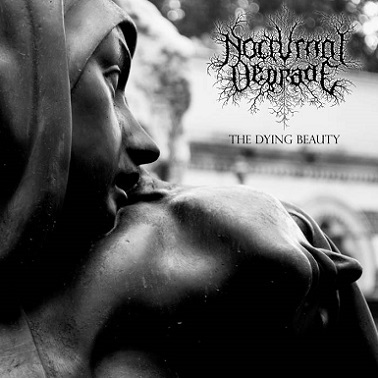 Nocturnal Degrade are a band from Italy that has been featured before in this zine and plays a depressive from of black metal and this is a review of their 2015 album "The Dying Beauty" which was released by Self Mutilation Services. A very slow, raw, heavy and depressive black metal sound starts off the album and after a few seconds the drums get more aggressive and high pitched suicidal screams make their presence known on the recording while the guitars also use a great amount of tremolo picking and half of the tracks are very long and epic in length. Throughout the recording there is a great mixture of slow, mid paced and fast parts and the riffs also mix in a lot of depressive sounding melodies while the faster sections of the music use a small amount of blast beats while also bringing back a bit of the old school style and when clean playing is added onto the recording it gives the music a touch of goth and dark wave. Whispers can also be heard in certain sections of some of the songs and when guitar solos and leads are utilized they add more melody onto the recording and as the album progresses more atmospheric and ambient elements are brought into the music and there is also an instrumental track before the songs make a return back to vocal tracks and all of the musical instruments have a very powerful sound to them and the last song is an instrumental ambient piece. Nocturnal Degrade creates another depressive black metal album that is a lot more raw and less ambient influenced than the previous recording while still keeping around some atmospheric elements, the production sounds very dark and raw while the lyrics cover suicide, life, decay, apathy, death and anti human themes. In my opinion this is another great sounding recording from Nocturnal Degrade and if you are a fan of depressive black metal, you should check out this album. RECOMMENDED TRACKS INCLUDE "In December" and "The Dying Beauty". 8 out of 10.